No, these aren't some sort of weird, AA battery, this is actually a 18650 Lithium Ion Cell. 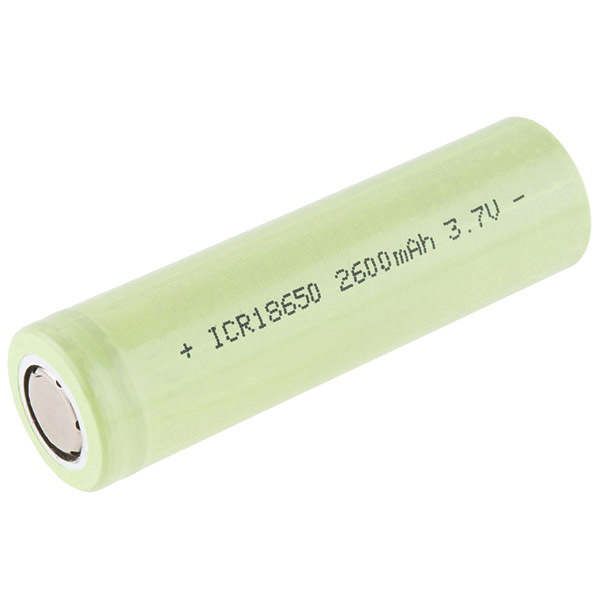 These round high capacity cells have been mainly used in flashlight type applications but with its capability to be used as a drop-in rechargable cell at 3.7V with a capacity of 2600mAh. This is a great battery option for those of you who need a simple to install and replace cell with a lot of juice. Can these be charged with the SparkFun USB LiPoly Charger Single Cell breakout? I assume that these cells do not have a built in protection circuit for over/under voltage and over current? We'd have to handle that on our own in the circuits we hook them up to? I tried to find a minimum voltage to avoid damaging the cell in the datasheet and could not... is it there and I just missed it? Also, it would be nice to have some compatible chargers in the recommended products. I assume that we could use any single cell li-po charger? There is no internal protection on these cells. They are designed to be assembled into packs. You are correct. Any single cell charger, or multi cell if you use the 2 cell battery holder, charger should work. This really should be in the description. Wanted to add that if people are used to using regular LiPo packs with built in protection they may kill these by draining them down too far. So for charging. Could I just put a male jst on a battery holder, and plug it into a lipo charger? Have been tested with a discharge rate of 0.4C (1040 mAh) in order to last 2.5 hours? It's supposed that with an standard discharge current of 0.2C (520mAh) the battery should last 5 hours. Increasing if the discharge rate is lower. I mean be more specific on that part, maybe it's only me but when I read "Additionally, these cells have been tested to last for about 2.5 hours and have a life span of about 300 cycles of use and recharge" Then I immediately think it's a bad battery, maybe because you don't say how you tested it (discharge rate, device, etc.) Just trying to help those guys looking how to power their sensors which can read that part same as I did. My humble opinion. You are correct, lower discharge = longer life. The cycle lifespan of a cell is a difficult thing to calculate in the real world. It relies on a number of factors including, maximum charge and discharge rates, minimum charge levels, and temperature. The 300 cycle life rated for this cell relates to how many full cycles you can get before the battery loses 20% of it's capacity. (80% remaining capacity in the datasheet). This assumes normal use. You can most certainly use the battery for more that 300 cycles but that capacity number will start to decline more rapidly. (Ever use an old laptop that has 10 min of battery life?) If you are kind to your cells you will get an excellent service life out of them. If you are me, you get about 10 cycles. These are eBay comparable prices for 18650s but I'm assuming you have a good supplier because none of the cells I've tested from eBay are even 1500mah (though they're all labeled >2000). So by "these cells have been tested" do you mean you've tested these specific cells or just 18650s in general? Sorry if it seems like I'm being over cautious. That's really the problem here: how do we know that these are actually good, tested cells? Are there discharge graphs? Are they all from the same consistent supplier (sometimes even they don't know if they're still good). There are so many poor quality LiPo cells, especially off eBay or out of Hong Kong, that finding a reliable, tested source is important. Some scammers even put a tiny LiPo battery to test as 3.7-4.2V, but the rest is just sand. Some sources go bad too, as the supplies are inconsistent. If you really care, you may be better off buying name brand AW or Panasonic brands if you can find certified sources. They're pricey, but if you need that capacity and reliability it might be worth it. It's wise to be wary of unbranded batteries, but apparently Sparkfun did find a quality supplier for us. Test results for a brand new battery from Sparkfun today measured the actual capacity to be 2583 mAh (well within the datasheet specs). Test was 0.2C constant current discharge from full charge (4.21V) to empty (3.00V). I need 100 units, but I see "limit of 2 per customer" ?????? This is basically an issue with shipping regulations. Email cservice@sparkfun.com and they might be able to work with you on this. The only thing I would check is how much bigger than the battery holder the projects case is (doesn't look like SFE carries smaller ones that would be appropriate) - perhaps you could fit more than one, and the charger board you have may be fine with it as well. Google '18650 parallel charging'. those are VERY different. the 4000 and 5000mah versions are known to be not very good. check out rsp's findings above. Charged two of these, inserted into two cell holder and wired a simple power switch in front of an Arduino pro-mini 5v. Wrote a simple sketch to flash lights on your cool 1M RGB addressable LED strip. Same setup with plain 9v battery works great, however this one runs a few seconds and then 1/2 the light strip just flashes (not part of program). Voltage coming from Arduino 5v power pin is only 2.2v when running on li-pos, 5v when powered by interface cable from laptop. Have a done something wrong, or do I need more amps? Trying to help my 11 year (2013 AVC Student Class 3rd place winner) finish his "tight" hiking stick before we leave on Saturday to scout camp. Open to ANY suggestions. Thanks everyone. If anyone is attempting to make their own vaporizer mod, these batteries are perfect, and much cheaper than the ones you get from dedicated stores. Are these cells of the same technology found in laptop batteries ? I.E. can I use these cells to rebuild my laptop battery ? Short answer No long answer Yes with a But: These are found in many popular laptop battery packs. But those packs usually have protection circuitry in them to protect them from over/under charge and heat. Then the cells "die" the circuitry shuts off and has to be "re-enabled" somehow (like they would at the factory when building them for the first time). They are also often soldered together in serial stacks of 3 parallel matched cells (for the 9 cell versions), meaning you'd have to cut and re-solder a lot of tabs, and that each group of parallel cells is MATCHED and equally charged upon insertion into the pack. Is there any way to weld solder tabs to these, or is that just asking to have your hand blown off? A bit late, but these are now available. DIY tabs are not recommended; they usually don't explode, but they are difficult to solder and it's easy to damage the battery in the process. 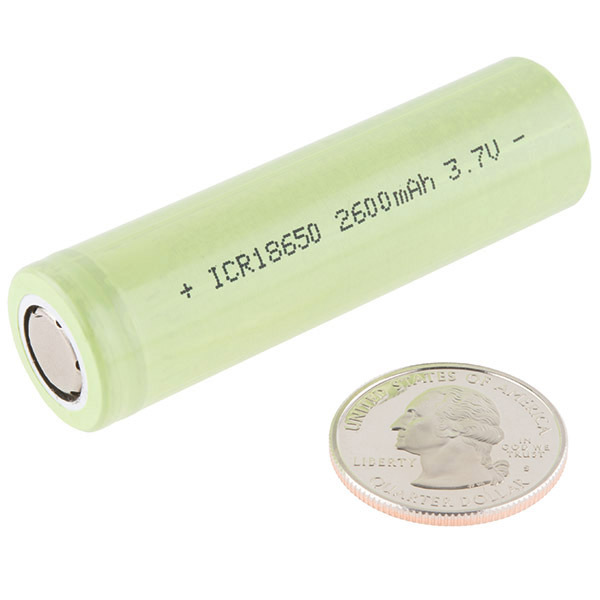 Batteryspace.com sells good quality 18650's with optional welded tabs, and in matched batches if requested (good for making battery packs).